When undergoing surgery, it is important you wear medical grade compression stockings that will help to reduce swelling and eliminate excess water that causes swelling and pain. If you know you are having surgery, invest now in an outstanding quality, durable pair of compression stockings to ensure a full and fast recovery, prevent life-threatening blood clots and reduce pain and inflammation as soon as you leave theatre. Your legs will undoubtedly swell with water following surgery to protect itself. Whilst this is totally normal and expected, excessive water retention can be very dangerous, causing blood clots – these can be life-threatening. Every surgeon will tell you the benefits of wearing support socks after surgery, and the Tonus Elast LUX Thigh-High Compression Stockings are made from the highest quality materials for maximum compression therapy benefits. They are made from expertly woven, breathable materials that apply medical grade compression from the tips of your toes right up to your thighs. The material is thick yet won’t overheat the skin and you can choose from black compression stockings or sand coloured. The leg band is strengthened with layering of the materials making it thicker and has silicone grips on the inside to ensure they stay up all day long; the heels and toes are also reinforced so you can guarantee these compression socks will last as long as you need them. An added benefit of thigh-high compression stockings is that for those wanting to wear a skirt of dress, you can do just that – the black stockings look just like normal tights, so you can go out and about still feeling like ‘you’. Commonly called varicose veins, CVI is a complaint that arises when the venous wall and/or valves in the leg veins don’t function properly. This means blood isn’t pumped back to the heart from the legs and it can cause leg pain and cramps, and a feeling of burning throbbing or restlessness in the effected leg or legs. When varicose veins are left untreated, life-threatening blood clots can occur. A blood clot happens when rather than flowing through the veins and back to the heart, blood sits in the veins and begins to clot together. Eventually the pressure from the restricted blood flow will force the clot to break free, allowing it to travel to the heart and lodge in the lung arteries, causing a pulmonary embolism. Studies by the Vascular Disease Foundation show that each year 100,000 – 180,000 people die as a result of a pulmonary embolism and every 5 minutes someone dies from a blood clot or deep vein thrombosis. Those with varicose veins need to be especially careful when seated for a long period of time, for example whilst travelling. Sitting for long periods of time greatly increases the likelihood of developing a blood clot from your varicose vein problem, simply wearing the Tonus Elast LUX Thigh-High Compression Stockings can help to eliminate this risk. The Tonus Elast LUX Thigh-High Compression Stockings are certified by the Latvian Phlebotomy Association and registered as a medical grade garment in more than 27 countries. They have been meticulously created using raw materials from leading European producers like Swisslastic and Zimmerman and are stitched using first class knitting machines by mechanical industry leaders. These garments are guaranteed to comply with all medical standards and offer the highest level of medical grade compression. What Size Compression Socks Should You Buy? 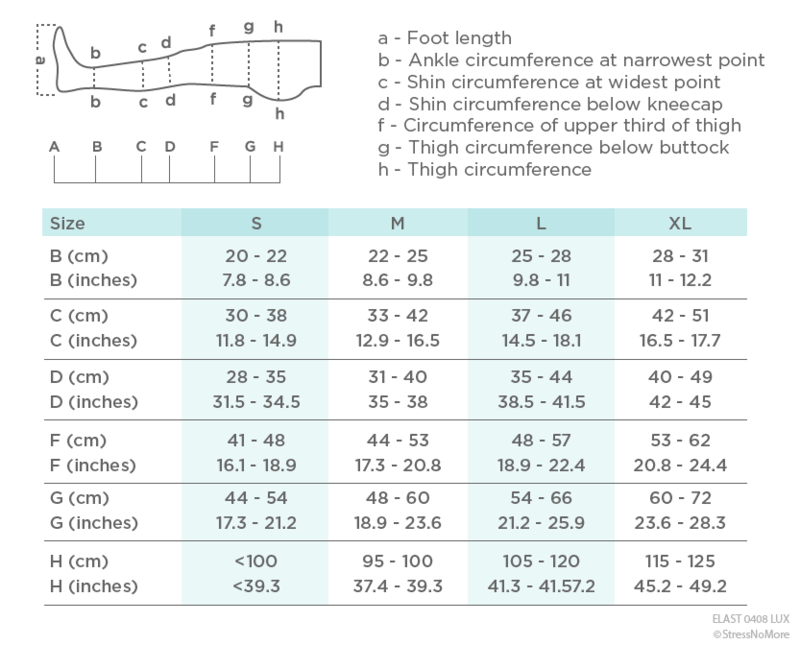 Simply measure your legs in the areas B, C and D as shown in the diagram below and select your size. Compression socks are designed to be tight fitting to your legs (this is how the compression works) so, when you first put them on you may wish to use talcum powder on your legs to make pulling them on easier. You should put them on first thing in the morning when swelling is at its lowest. Hand wash in soapy water up to 40°C using a suitable detergent. Do not bleach or dry clean. After rinsing in water, slightly squeeze with your hands, do not wring, do not tumble dry. Dry flat.